Spring is storm season and that means more power outages and electrical surges. Keep your business rolling when the storm is rocking by protecting your sensitive equipment from damaging shutdowns and power gaps with the PFC Sinewave UPS Series. Equipment with Active PFC, can be sensitive to the power gaps created by simulated sine waves. If a backup battery generates a simulated sine wave output, computers with Active PFC power supplies may detect the power gap and shut down unexpectedly resulting in data loss or equipment damage. Sine wave output is clean with very low harmonic distortion making it the ideal waveform for running today’s sensitive electronics such ENERGY STAR® 6.0 systems and high-end audio/visual equipment. 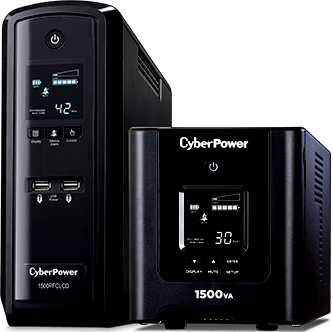 For optimum performance, stay in rhythm with the CyberPower PFC Sinewave UPS Series to ensure the highest degree of reliability and operational efficiency. *Extended warranty coverage available at additional cost. Extended warranty increases terms of warranty coverage from three to five years from the date of purchase. Contact your sales representative for details.